Waterproof membrane and stone edging down. 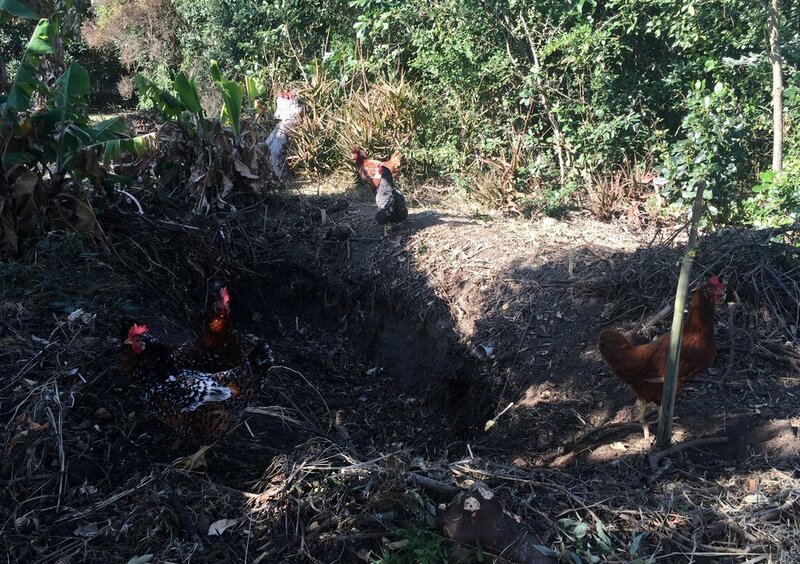 Wiseman the gardener, cleared the compost heap from one of the banana pits today and it's quite a deep hole. The chickens loved it and all moved in to feast on the insects and grubs. The highlight of the day was laying the membrane and waterproofing around the Suikinkitsu; then laying the edge stones and some of the loose beach-gravel. It's looking good! Slight problem though with the drainage run-off missing the holes in the top of the suikinkitsu! But that will be resolved tomorrow with some ingenuity and waterproof paint. One of the daily delights is watching the Trumpeter Hornbills fly back and forth across the site. Smart-looking black and white birds with large bills; they call as they fly. Yesterday I watched one pecking loudly at his reflection in a glass shed-window pane, while his mate looked on bemused! Hornbills and most birds fly in the same corridor across site. Today a large troupe of Hornbills perched in a nearby tree. The water in the house is mainly rainwater collected from the roofs. It is pumped up to a header tank on the dunes once a day with an intriguing whooshing noise; the pump will be solar powered in the future.